There are "Internet Explorer 8", "Internet Explorer 8 Compatibility Mode", and IE7 mode in IE8. However, the default setting in IE make all intranet website use "IE8 Compatibility Mode" even I have setted doctype, the meta tag, http header as suggested to force it into IE8 mode. But it still goes into "IE8 Compatibility Mode", without any changes in IE setting. How to force it into pure "IE8" mode, without change any browser's setting? PS. I am not talking "document mode" here. Seem that MSFT has not consider a large intranet environment that we have many different web application running inside. There is no way to bypass the IE8 setting, according to somewhere I read on MSDN forum. So, I will have to beg my system administrators to put some new group policies to change "Compatibility View" setting and the value and prevent user change the value, until MSFT discover this bug and fix it. From an MSDN blog post (emphasis theirs): "Browser Mode is chosen before IE requests web content. This means that sites cannot choose a Browser Mode." It is possible to override the compatibility mode in intranet. Just add the below code to the web.config. Worked for me with IE9. You'll have to make some adjustments to IE. 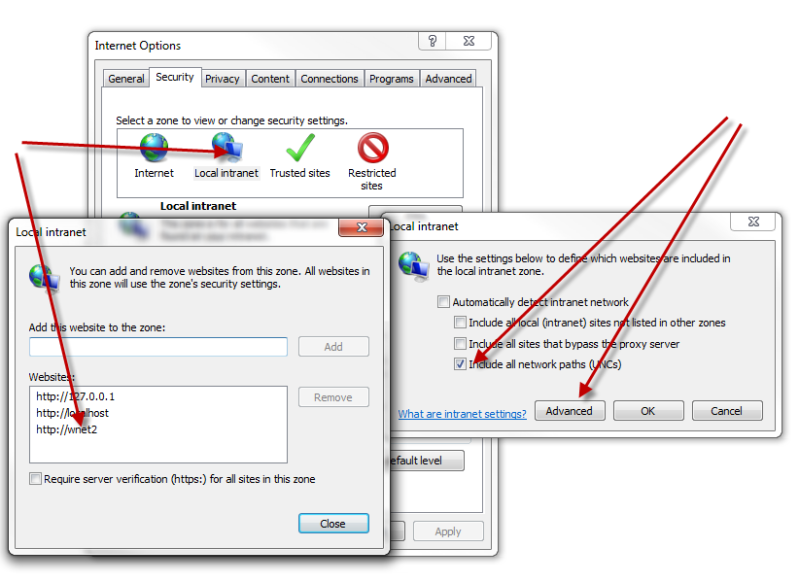 Under : Local Intranet inside Sites, uncheck "Automatically detect intranet network". If your intranet uses default settings for IE, IE7 Standards Mode is enforced for intranet sites regardless of any website settings. Let’s look at some examples. If you navigate to sites on your local intranet like http://myPortal and http://sharepoint/sites/mySite, Internet Explorer 8 identifies itself with a User Agent string of ‘7’, Version Vector of ‘7’, and displays webpages that trigger standards mode in Internet Explorer 7 Standards mode. This combination allows webpages that worked correctly in Internet Explorer 7 to continue to do so in IE8. To override the Compatibility View settings for intranet or all websites you need to make IE8 emulate itself. Set a custom HTTP header instead of using the <meta... in the <head> section. These are supposed to be equivalent, but I have seen that an X-UA-Compatible HTTP header from the server will override IE 8's "Display intranet sites in Compatibility View" setting, where the <meta... element would not. Read somewhere that the DOCTYPE declaration must be the very first line. No comments of any kind, nor empty lines. In combination with setting the HTTP Response Headers, this worked for me. Browser Mode went from "IE9 Compatibility Mode" to just "IE9 Mode". Not the longer statement in Dennis' question. just for kicks i tried EmulateIE7 and that worked as well. simplifying the extended !DOCTYPE was key. If browser see port number in url - hi "think", that's is intranet. The answer marked as "correct" is technically correct but suggests that there is no solution to the real issue being faced by most people that is: "how do I properly show on IE8, with compatibility mode enabled, a web application which does not support compatibility mode?". this worked for me on several workstations. If the above code is implemented on application side, IE8 appears to behave as if it was not in compatibility mode, even though it will still show browser mode as compatibility mode. Not the answer you're looking for? Browse other questions tagged html internet-explorer-8 ie8-compatibility-mode x-ua-compatible ie8-browser-mode or ask your own question. how do I properly show on IE8, with compatibility mode enabled, a web application which does not support compatibility mode? Is disabling browser compatibility mode for intranet sites programmatically possible? Will there be any differences in a page thats rendered in IE7 compared to the same page rendered in IE7 standards mode in IE8 browser?